Hey everyone. Are you hooked on MADWORLD yet? If you aren’t, come back and read this blog after you’ve cleared MADWORLD ten more times. MADWORLD is now available in Europe, so this blog is going introduce some replay goals that will make your MADWORLD experience ten times more fun. If you’ve already driven yourself mad by playing the game too much, this blog post might not be up your alley; however, for those who are keen to keep chomping at the bit, definitely read this blog and have an even better time playing MADWORLD again. 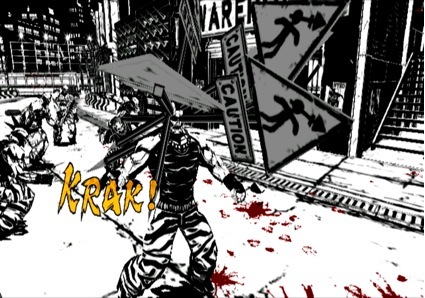 MADWORLD’s most famous kill has to be shoving a sign post into an enemy’s head, but did you know that you can impale up to five signs into a single enemy? When I look at some of the gameplay video that users have uploaded to Youtube, it seems that everyone is stopping at a single sign post. That’s just an unbelievable waste. If you use multiple signs, you will earn more points and a higher rating for your attack. Not to mention an enemy with five signs in his head is incredibly funny! Big Bull Crocker is the overbearing guy wearing a bull helmet and charging at you with a double chainsaw. You guys are probably all trying to take him out with Jack’s chainsaw or punches. And I figure that you have all had a power struggle with Bull at least once. After winning that power struggle, Big Bull will stand there winded. That is when you can actually impale Big Bull Crocker with a sign post! He is only standing there for a moment, so your chance to pull this off is small, but you can impale up to 5 posts into Crocker. I’ll share another tip for dealing with Big Bull Crocker! Get Bull in front of a Rose Bush (Spiked Wall) and attack him. Any attack will do, so give it a try. You can actually impale Big Bull Crocker onto the Rose Bush. Depending on his health, he will either die or be disabled by the spikes. When he is disabled, you can use your chainsaw to cut chunks out of him and send him to an early grave. Give it a try! I love this technique, so impale him with a sign post, plant him on a rose bush, and let the Bull know who is boss. When you are in the Station portion of the first stage, there is an attache case in the area. The one that says “CASH” on the front. If you pick that up and throw it, all the money inside will fly up into the air when it hits the ground. The enemies who see that will lose all interest in Jack and head straight for the cash to gather it up, forming a pack of enemies all in one spot. Throw the cash onto the train tracks and get all the enemies to gather there! A few moments later, a train will come blasting through the station and smash through the cash loving horde, wiping them all out. There are the sorts of ways you can use the attache case cash to raise your kill efficiency and take out lots of enemies. In every stage there is a lure item, so once you find them make sure to take advantage of them. Everyone is interested in the story, so they clear an area and move on to the next to see what will happen. However, MADWORLD may be a linear game, but you can revisit areas that you have completed. Sure, playing the same stage the exact same way is OK, but it won’t stay fresh for long, so we’ve included extra missions. Each area has a different mission, with up to four missions added in one stage. As the missions change, it will give you a different sense of urgency in each area to complete the mission, so you really should give those stages another shot! There are other things I’d like to add, but for now, I suggest checking out the MADWORLD strategy guide that is on sale in stores now. There is lots of great art featuring Jack and the enemies from MADWORLD, so everyone should own their own copy! So here is your last bit of INSIDER INFORMATION! In the 2nd stage area known as Bistro La Lusty Geisha, go to the tempura area and try to place as much tempura as you can on the plate in a single go, then ring the bell. You will find something well worth your efforts!